Alien Sunshade is a black mesh screen made of lightweight, durable Polyester. With 13 bungee ball cords, it fastens snugly to your Wrangler's roll bars, letting you answer the call of the open road while reducing UV rays that lead to harmful sunburn and fading & cracking of your vehicle's interior surfaces. No tools are required, and it even fits under your hard top or soft top with the removal of just a couple of bungees. 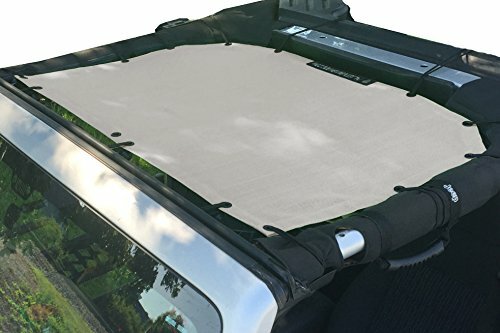 Our innovative shade top sunshade fits 2007-2017 Jeep Wrangler 2-door and 4-door models. PROTECT YOUR FRONT PASSENGERS and your Jeep interior from harmful UV sun rays, without giving up that open-air / top-down feeling. Durable woven PVC mesh cuts down on wind noise while reducing UV exposure. EASY INSTALLATION requires no tools or vehicle modifications. Includes 13 bungee cords that fasten around the roll bars for a snug fit. No need to remove your sunshade to add your hard top or soft top. If you have any questions about this product by Alien Sunshade, contact us by completing and submitting the form below. If you are looking for a specif part number, please include it with your message.